Kitchen! Kitchen! : figs & duck.....at kitchen! kitchen! 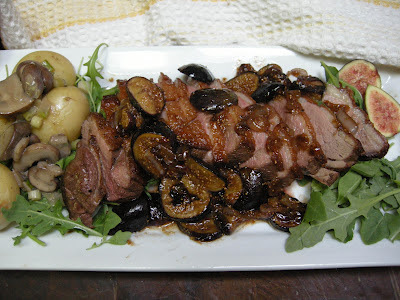 Figs and duck don't rhyme but they are beautifully delicious together! 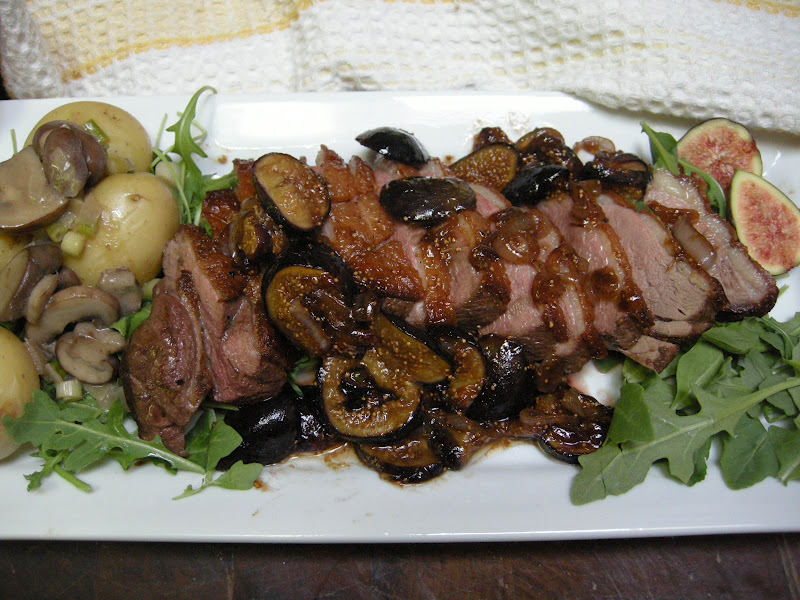 Breast of duck seared and topped with sauteeds figs in butter. I am like a kid in a toy store, when I am at Delicious Orchards. They have all the freshest and rarest produce, meat, cheese, etc. that you seldom find in any supermarket. Then there it is, a table with nothing but just figs was just incredulous. Looks like a truckload was just unloaded this morning. Not too ripe, nor bruised , and the size of the fruits are perfect. I've got to have some figs! And in the meantime, I will just mosey over to the meat section. Aha! A breast of duck! Perfect! On a very, very hot cast iron pan with a little olive oil- sear each side (skin down first) for 3-4 minutes until all sides are golden brown and continue cooking in a 400F degree preheated oven for another 10-15 minutes. Cover with aluminum foil, set aside and let it rest before slicing. On a separate pan, heat some olive oil and a tablespoon of butter, sautee the shallots until soft, add a pinch of salt. Add the sliced figs, some honey, stirring until well incorporated (add some duck juices from cooked duck). Add a drizzle of brandy or white wine and let the alcohol evaporate. Check for seasoning and pour the fig sauce over the duck. Serve with boiled potato and salad.